That’s probably what global explorers like Christopher Columbus, Marco Polo and Sir Walter Raleigh first wrote in their journals as they were setting off around the known world discovering strange lands, new civilizations, and yes, yummy fruit to scoff. 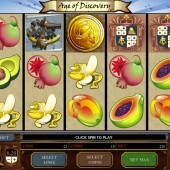 Those centuries of forging new frontiers – the Age of Discovery – are the inspiration behind online casino slot developer Microgaming’s 5 reel, 25 pay-line video slot that are crammed to the rafters with pretty graphics and juicy bonuses. On the reels - to go along with such seafaring, er, fare like compasses, sextants and coats of arms -are the dragons believed to inhabit those strange new lands, plus plenty of avocados, bananas, figs and pomegranates. 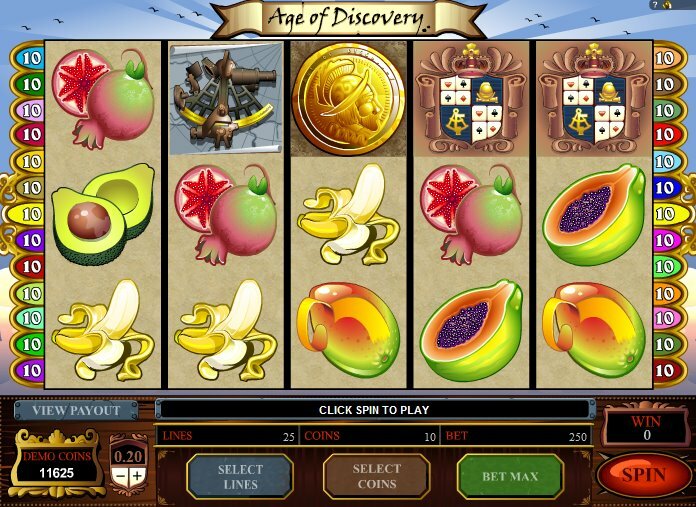 It’s a nice twist on the ‘fruit’ icons of classic video slots, here replaced by fruits that were brought back to Europe by the first naval explorers. The golden doubloon is the Wild symbol, and this valuable coin substitutes for all symbols other than the Scatter and Bonus. It’s a very valuable coin, as it turns out, awarding a top whack of 60,000 coins if you hit five across the reels. Here be Dragon Scatters in this slot too, as the Dragon symbol is the Scatter. Three or more on the reels pays out a reward up to 80x the line bet, but it’s the Compass symbol you need to look out for in terms of bonus rounds. Three Compass symbols anywhere triggers the ‘Treasure Bonus’ round – an elaborate Pick ‘Em Bonus feature that presents you, the intrepid slots explorer, with 30 dig sites. Keep selecting sites to reveal cash wins until you hit a Skull ‘n’ Crossbones, ending your turn. You’ll still receive some cash if you pick the pirate flag first go, so there’s always a chance of getting something in the bag from the off. History and the mystery of travel always seem to make for an interesting slot, and Age of Discovery is no exception. I would have liked to have seen another bonus feature to spice things up a little, but the Pick ‘Em Bonus is a bit more expansive than other Microgaming offerings. With betting starting at just $0.01 a coin, small bettors are catered for, and for this it’s probably worth a look. As for other history-themed games to check out, Microgaming’s adventure-themed slot, The Grand Journey, is a great ‘find’ - particularly with its Expanding Wilds and free spins round - while iSoftBet’s fantasy-inspired Around the World is great for escapists everywhere.